It's nice sometimes to just pick up a comic, and unwind with a tale that doesn't feature limbs flying, death or zombies. Right now, DC's Tiny Titans is one of the best places of 'light entertainment' and Archie has been the flagship of the medium for over 60 years. 'Bout time someone stuck them together huh? Well, someone finally has. 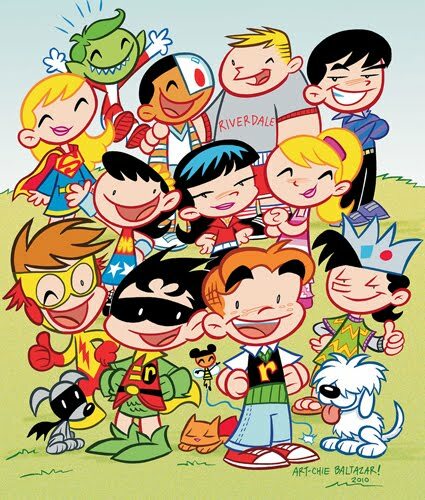 Revealed on DC's Source blog, October's Tiny Titans/Little Archie, will see two of comics' oldest publishers team up for a truckload of all-ages fun. Archie spent years deciding between Betty or Veronica, how will he handle Donna Troy and Supergirl? Or how will my man Jughead, cope with the craziness of Beast Boy? Done by the Tiny Titans team of Art Baltazar and Franco, if Tiny Titans/Little Archie is half as fun on paper as it is in thought, it will prove while comics have grown from just 'funnybooks' there's still nothing wrong with being exactly that. From what I've heard it's pretty sweet too Pensol. If you grab a copy let me know what you think!